Our bathroom sink's drain was really clogged last week and I was thinking about how to clean it without using chemicals like Mr Muscle that I've used in the past. Now I am not sure if the chemicals in Mr Muscle are bad for the environment or not but I wanted to try to do it with stuff that we had at home. 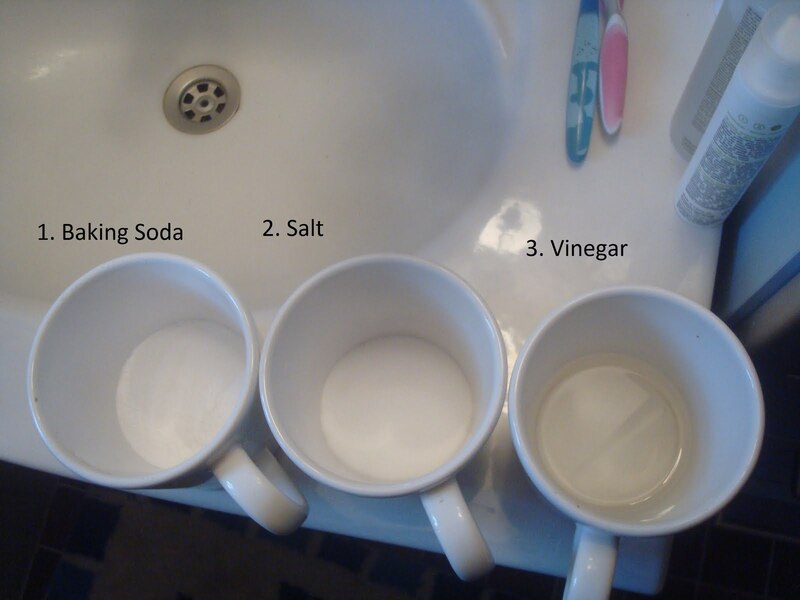 Put some water to boil and get three cups, one with baking soda, one with salt and one with with vinegar. Make sure that the sink is dry. 4. Last pour the boiling water on top. The kid in me really enjoyed this little home made chemistry and the best thing is that it worked! No more clogged drain, without needing to buy any chemical based stuff from the store and it was fun too! It's great to know that this method works for you, Cat! I wish it's the same for all plumbing problems – fixable by natural home remedies. Most chemical cleaners are safe to use, as long you followed right the given instruction. But if you're having doubts using them, call your trusted plumbers. It is important that you know how to clean up your clogged drains in your house. We should help those people who deserve for it and professional resume writing new york available here and learning very necessary for all of us while get quickly essay services. It's amazing that the results are almost instantaneous. Although, there should be no surprise, as you used all of the powerhouse components of DIY cleaners. Vinegar and baking soda are known as effective cleaning agents. Match them with a boiling water and the end result will be terrific. Still, one shouldn’t expect this trio to fix all the plumbing problems, particularly those that are caused by a faulty plumbing structure or big blockages. You should also see the methods of how to prevent your drains from clogging. Like, to avoid hair strands blocking your drains, you can put a filter that can keep the hairs from entering your drainage system. Those methods work for common drain blocks, but if the clogging is severe, you may need to recheck the pipe system. They could be doing a great job, but are they really going to guarantee that they can take care of your needs? Therefore as soon as you face any such problem, it makes sense to get residential plumbing services Midlothian. You may consider doing the repairs yourself, but in any case hiring a professional plumber to do the work for you is much better and easier. However it is quite important to look for a professional and qualified plumber. Contractors Today! Absolute Draining & Plumbing company offers a complete drain cleaning service for residential, industrial and commercial customers. Our professional plumbers are dispatched day or night and arrive equipped with the latest electric drain cleaning machines. Need quality service, call us today!